Angelo Rivera catches his breath after his five-round title fight at Praetorian MMA. How appropriate that on Memorial Day weekend, two Patriot Boxing fighters and a young man headed off to the Marine Corps dominated their fights and won titles Saturday night at the first-ever Praetorian MMA show. In the main event, Team Top Notch fighter Ray Bunker took Omar Jasso down at will and used vicious ground and pound over five rounds to win the Praetorian featherweight title. The former Fenton High School wrestler did a lot of damage from inside Jasso’s guard, shaking off submission attempts and landing big shots to both the body and the head. Jasso did rally late in round 5, and bloodied Bunker’s nose with a well-placed up kick, but all three judges scored it 50-45 in favor of Bunker. Bunker said in his post-fight interview that he recently joined the Marine Corps and he told Chicago’s MMA that he leaves for Camp Pendleton and basic training early in August. Patriot Boxing took home two championship belts and had an entire section filled with fans to support their fighters. Both Manny Vazquez and John Marino came out to huge roars and neither disappointed in their performances. In the bantamweight title fight, Vazquez fought through an early submission attempt from opponent Thaddeus Nestor, got to full mount and pounded on Nestor until referee Rob Madrigal stepped in to end it at 2:05 of the first round. Vazquez remains undefeated at 4-0. John Marino put on a wrestling clinic against Lydell Miller in the Praetorian lightweight title fight. Marino wasted no time in landing a double-leg takedown and putting Miller on his back. Miller showed plenty of heart, but Marino was relentless in his wrestling and Miller had no answer for it. The end came at 2:13 of the third round when Marino finished Miller with a barrage of strikes from the mount. Like Vazquez, Marino remains unbeaten at 4-0. Combat Do’s Angelo Rivera Jr. and CounterStrike MMA’s Andrew Potapenko put on a fight that was pay-per-view worthy in the welterweight title bout. Both fighters landed significant strikes in round one, and Rivera scored a huge slam at the end of the round. He walked back to his corner with a mouse under his eye, but it did not bother him nor become a factor in the later rounds. In round three, Rivera attempted a spinning back kick that was not received well by one of his coaches. “F— those high kicks!”, was shouted from the corner, and Rivera responded but pummeling in on Potapenko and using a slick trip to get him to the ground. Potapenko turned the tide in round four by working in the clinch and punishing Rivera’s midsection with a number of knees. But after an action-packed fifth round, the judges scored it unanimously for Rivera, who wins the first Praetorian welterweight title. Combat Do’s Bob Schirmer told us that nine of those 18 win have come in title fights. 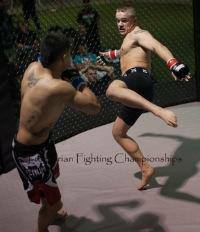 In tournament qualifier bouts, CounterStrike MMA’s Kyle “The Vanilla Gorilla” Kurt showed tremendous poise in the cage in his fight with Levi Atkins. He displayed excellent Muay Thai and counter-striking (no pun intended) in securing a TKO victory in the second round. He definitely looks like a prospect to watch in the near future. Kevin “Scrappy” Schmidt had the submission of the night when he fought through a gruesome looking shoulder lock, escaped and and quickly sunk in an ankle lock that made Austin Lizot tap almost instantly. Lizot was able to gingerly make his way out of the cage. 1:30 rd. 1, TKO-strikes Gray. 2:16 of rd. 1, Olson def. Wittman, ref stoppage, strikes. Angelo Rivera is a great champion like his Dad. I look forward to seeing him in the UFC !